The Crested Gecko (Correlophus Ciliates) is a species of gecko native to southern New Caledonia. This species was thought extinct until it was rediscovered in 1994. The crested gecko is endemic to South Province, New Caledonia. There are three disjunctive populations, one found on the Isle of Pines and surrounding islets, and there are two populations found on the main island of Grande Terre. One population is around the Blue River, which is a protected provincial park, and the other is further north, just south of Mount Dzumac. 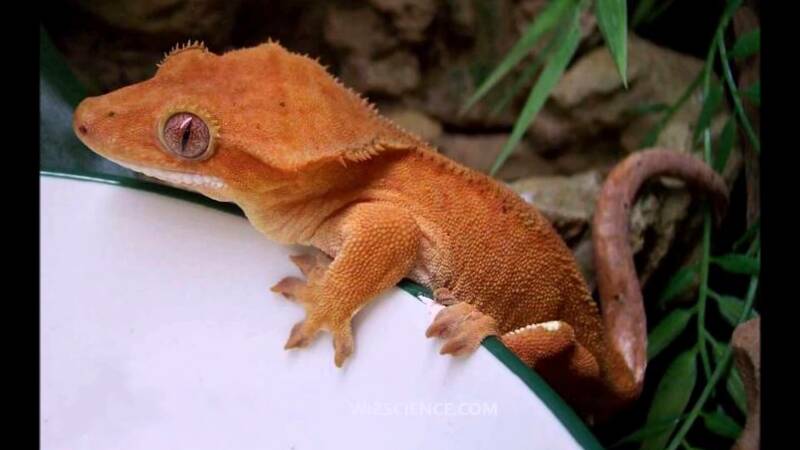 The Crested Gecko has hair-like projections found above the eyes, resembling eyelashes. It has a wedge-shaped head and a crest that runs from each eye to the tail. Crested geckos do not possess eyelids, so they use their long tongues to moisten their eyes and remove debris. Their toes and the tip of the semi-prehensile tail are covered in small hairs called setae. Each seta is divided into hundreds of smaller (approximately 200 nanometres in diameter) hairs called spatulae. It is believed these structures exploit the weak van der Waals force to help the gecko climb on most solid surfaces. The toes have small claws which aid in climbing surfaces to which their toes cannot cling. They possess a prehensile tail which they use to assist in climbing. The tail can be shed as a deterrent to predators. Unlike some other geckos, once they lose their tail it will not grow back; however, this is not as harmful to the gecko as it is to others, such as the Leopard gecko. The crested gecko has many naturally occurring colour groups, some of which include: grey, brown, red, orange, and yellow of various shades. They have variable markings, which include spots, straight stripes, and tiger-like stripes. The colors are brighter and more prominent at night. The crested gecko has distinct structural morphs in head size and crest abundance. Geckos with a head length less than 1.3 times its width are considered "crowned" crested geckos. They can vary in the amount and size of the crests; some have crests that extend to the base of the tail and some lack crests on one side of their body. Crested geckos are omnivores, feeding primarily on insects, nectar, and fruits, hunting and feeding at night. Click HERE for a Crested Gecko care sheet.